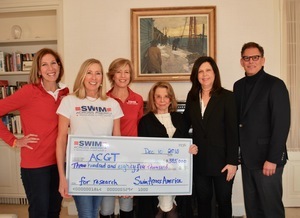 Swim Across America Fairfield County raised $385,000 in 2018 for its beneficiary the Alliance for Cancer Gene Therapy (ACGT) from its open water swim and other fundraising activities throughout the year in 2018. The funds raised support cancer gene therapy research funded by ACGT. In the past 12 years, Swim Across America Fairfield County events have raised more than $3.8 million for crucial support of the Alliance for Cancer Gene Therapy (ACGT). One hundred percent of all Swim Across America Fairfield County funds donated to ACGT go directly to support ACGT’s funded scientists. The Swim has supported nine different scientists over the past 12 years. The 2018 Swim supported four ACGT scientists working on immunotherapy treatments for osteosarcoma, novel new immunotherapy treatments for blood cancers, immune-based therapy and vaccines for melanoma and virotherapy for brain cancer. The 2019 open water Swim is scheduled for June 22, 2019, on the shores of Old Greenwich and Stamford. Pictured are Swim Across America co-chairs Michele Graham, Lorrie Lorenz and Nancy Carr with ACGT honorary Board chairman and co-founder Barbara Netter, ACGT executive director Margaret Cianci and CEO and president of ACGT, Kevin Honeycutt.